I gave you a heads up a few weeks ago so there's no excuses to miss the fun in East London next weekend. Next Saturday the 16th October at THE CAMP (City Arts & Music Project) 70-74 City Road London EC1Y 2BJ from 9pm til 4am (nearest tube OLD STREET). 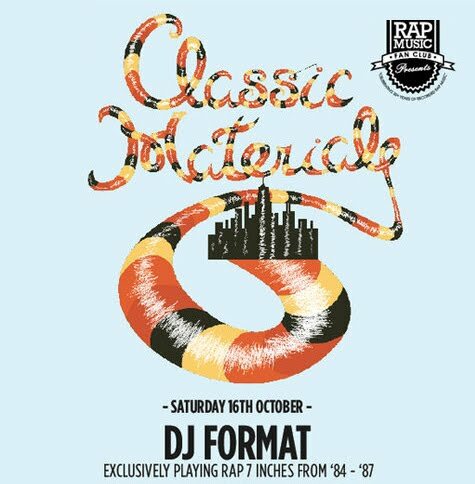 Playing nothing but rap records from 1979 to 1987. Myself KID DYNO will be warming up the wheels of steel for none other than DJ FORMAT playing a 45s set, along with super-tight deck action from CHRIS READ & DJ NICKNAME - don't miss out..!! Again wish I could reach this but got other commitments that night ....good to see people putting the Daily Diggers on ...have a good one.